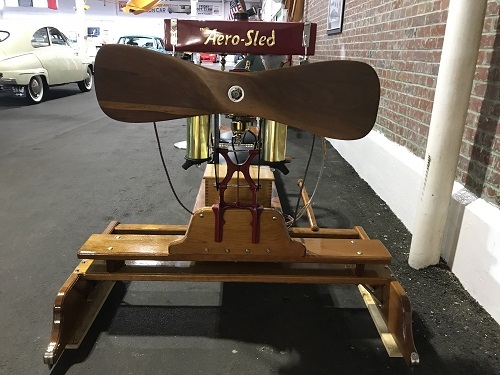 Introduced in 1914, the Aero-Sled Company of Chicago, Illinois, marketed their propeller-powered vehicle as both a practical means of winter transportation and for the new winter sport, motorized ice-sledding! The Aero-Sled was driven much like a car (in theory), with cushioned seats, a steering wheel guiding the skids, and a large handbrake to “bring your Aero-Sled to a standstill in a couple of lengths”. 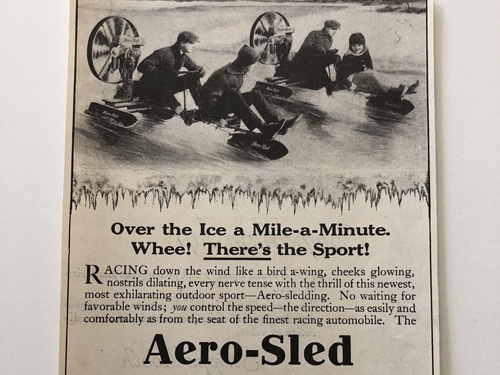 Period ads in magazines such as Popular Mechanics claimed the Aero-Sled was the “King of Winter Sports”. It could putter along on snowy roads at 10 mph and achieve speeds on frozen lakes of up to 50 mph! The Aero-Sled was powered by an Aerothrust propeller engine. Sometime in 1915, the Aerothrust Engine Company bought out the Aero-Sled Company and moved operations to Aerothrust’s headquarters in La Porte, Indiana. The aftermarket Aerothrust engine had been a popular addition to rowboats, canoes, and even bicycles in the years following WWI. The “Magnalium” dual-fuel alloy twin weighed 50 pounds and produced 3 horsepower. “It burns gasoline or kero-sene, and any man, woman, or child can operate it” boasted period advertisements. The ingenious mount allowed for variation in height and angle, and the engine could be installed or removed in under a minute. The advertised price for this boat/bike add-on was $50, while a complete Aero-Sled was $125. In reality, Aerothrust engines had the effect of a really big fan but with very little pushing power, depending on the weight of the vehicle it was pushing. 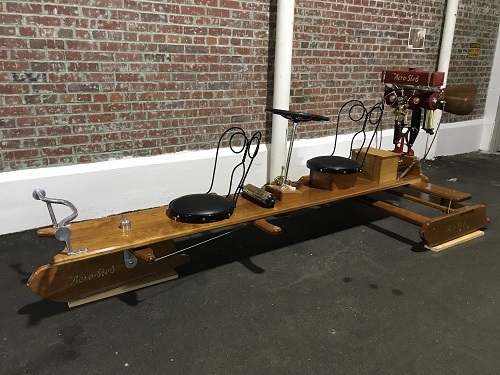 This replica Aero-Sled was built by Mr. Richard Mussehl in 2017-2018 in Lena, Wisconsin.